As wonderful as Chinese tea is, it is definitely not something you’d closely associate with exhilaration, adrenaline and the fear of death. Mt. 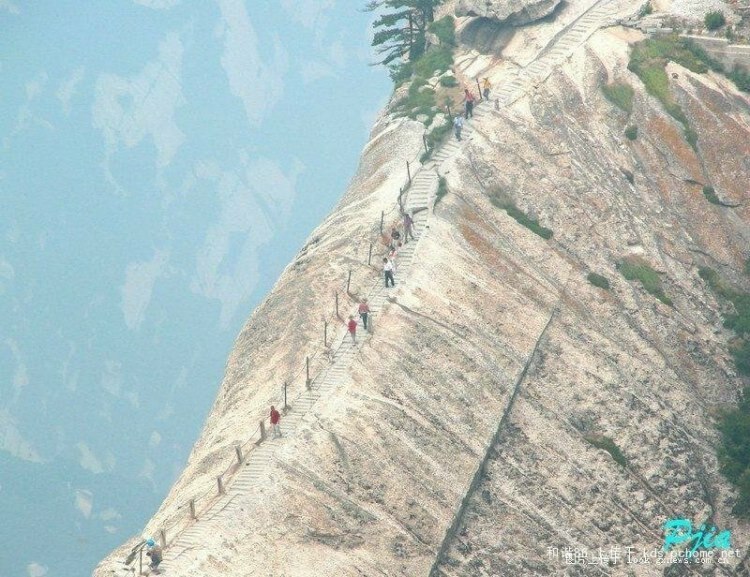 Huashan in China, however, manages to bring all of these things together by featuring a death-defying cliff-side mountain climb that brings daring visitors to a tea house 2,160 m (7,087 ft) up on the mountain’s southern peak. Mt. Huashan has been a place of religious importance since at least the 2nd century BCE, when a Daoist temple was established at its base. Since then, pilgrims, monks and nuns have inhabited the mountain and the surrounding area. A network of dangerous and precipitous trails allows them to access the mountain’s five summits, each of which has a religious structure like the tea house on the southern summit. Together, these five summits form the points of a flower shape. The paths have been reinforced due to a recent influx of tourists, but they are nonetheless dangerous, and carry a reputation for fatal falls. Although no official statistics are kept, some say that the number may be as much as about 100 fatal falls a year. Some of the more dangerous parts of the trails have names like Thousand-Foot Precipice, Hundred-Foot Crevice and Black Dragon Ridge. The surrounding area is fascinating as well. Mt. Huashan is located in the city of Huayin, which is considered the 3000-year-old cradle of Chinese culture and the site of the famous Terracotta Warriors.